Polish writer; born 1809; died at Warsaw 1868. 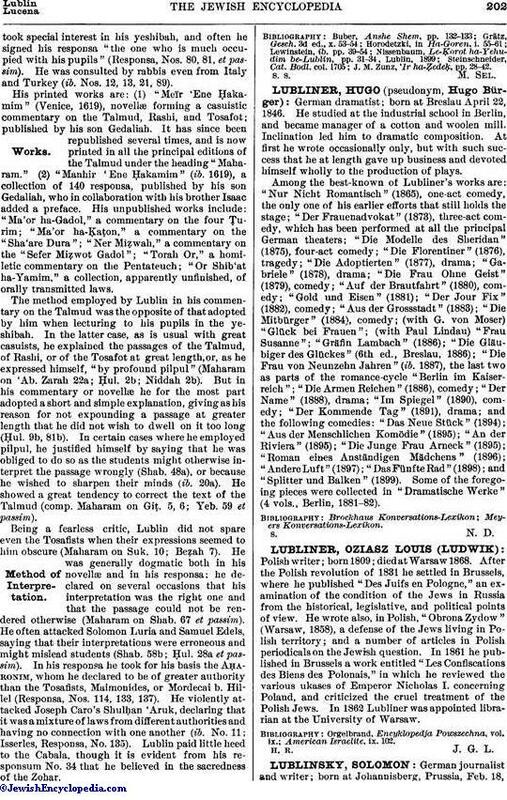 After the Polish revolution of 1831 he settled in Brussels, where he published "Des Juifs en Pologne," an examination of the condition of the Jews in Russia from the historical, legislative, and political points of view. He wrote also, in Polish, "Obrona Zydow" (Warsaw, 1858), a defense of the Jews living in Polish territory; and a number of articles in Polish periodicals on the Jewish question. In 1861 he published in Brussels a work entitled "Les Confiscations des Biens des Polonais," in which he reviewed the various ukases of Emperor Nicholas I. concerning Poland, and criticized the cruel treatment of the Polish Jews. In 1862 Lubliner was appointed librarian at the University of Warsaw.